The arch of a foot is formed by the tarsal and metatarsal bones. There are certain foot types, as well as certain foot, ankle, and lower extremeties, that are more susceptible to increased pressures through the arch of the foot. improve the inherent structure of the foot and to reduce the strain. decrease the tension in the tendons and fascia (tissue in bottom of foot). The solution is typically to add custom orthotics to shoes. Dr. Richardson makes a 3D digital scan of the feet for the creation of orthotic shoe inserts that are precisely mapped to each foot. During the orthotic design, she controls the amount of arch support needed by a patient. The amount of arch support can also be modified during a followup appointment. 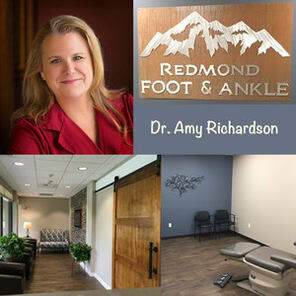 Dr. Richardson is highly experienced at solving foot pain issues using custom orthotics. Schedule your appointment today!